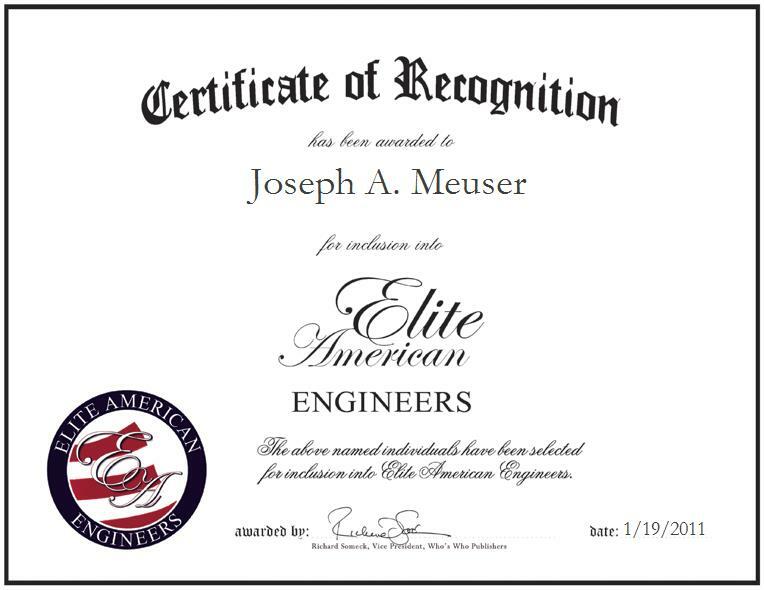 Lamar, Montana, January 19, 2011, Joseph Meuser, Retired Engineer, has been recognized by Elite American Engineers for dedication, achievements, and leadership in engineering mathematics. Culminating his career after 58 years, Mr. Meuser accredits his vast successes to his persistence and sense of confidence whilst performing challenging assignments. As an engineer, he worked for the government in the molecular field of various agencies by employing his mathematics skills and maintaining the mental image of matter. The highlight of Mr. Meuser’s career was advancing scientifically on an experiment for the University of Leeds in England. The research was primarily focused on the techniques related to optical transforms of light and devices. His commitment to the project catapulted his career and made him a reputable engineer in the subject. Mr. Meuser was prompted to enter his profession after completing a master’s degree in physics from Pittsburg State University, and working as a weapons developer. While gaining experience, he discovered his ability to envision a design and perform calculations before moving forward with its implementation. An affiliate of the Institute of Electrical and Electronic Engineers, Mr. Meuser was awarded with a FAME Medal for his outstanding engineering services.